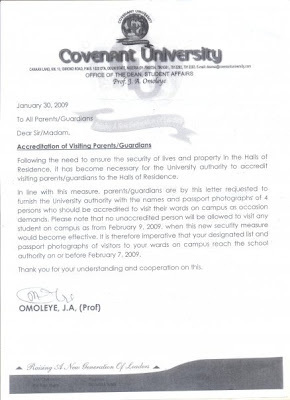 Naija Daydreamer: Is Covenant a University or a Primary School? I just saw the above on a post my friend did on F.B. I have alot of friends from Covenant university, and I am sure they do a fine job in the education department. But it is supposed to be a UNIVERSITY for God's sake, an institution of higher learning, not a freaking 10year old primary school. Like what the hell??? Now I understand that it is meant to be a uni with a religious affiliation, but what is caging curious and hormonally charged adolescents in, not having phones, not talking to boys and taking hiv tests before graduation have to do with education? The truth which they seem so painfully in denial of, is that if people want to be good they will be, same way if they want to be bad, all the restrictions in the world will not stop them. One of the most important aspects of university is growing up, getting independent, learning how to cope in the adult world, meeting new people, trying new things, experimenting with alcohol, drugs and all the vices in the world so you can discover who you are as an individual. Uni days have been the most exciting part of my life, and I would do it all again in a heartbeat. None of my cov uni graduates share this sentiment, they all could not wait to leave, and hate re-living the experience. When they leave the uni, they will still do all these supposed "bad" things so what are they really achieving? Right now, probably the award for the most expulsions in the world. All these "rules" just promote hypocrisy in an already all to hypocritical society. And if there's anything I hate its hypocrisy, especially religious hypocrisy. I thank God for having liberal parents, who showed me that being religious and being a good person are two completely different things, and the latter is far more important. Unfortunately, if Nigeria's university weren't so fucked up, we wouldn't have to deal with all this crap. At the rate things are going, in 50 years, everyone who can afford it will go to a private university, just like secondary school, cause they are springing up everywhere. And if this is the bull they are feeding them, safe to say my kids will be schooling in Ghana. Just 1 more post till my 100th! Woohooo! Am sure u knw d drill by now! Private universities in Nigeria are socially inept I'm afraid to say. You should see the dress code for Babcock university. It is hilarious! University is to prepare you for REAL life! Academics is only one little aspect of learning in a Uni. if you have the time maybe you should transcribe the text in the letter..
Myne, after hearing a detailed account of life in both unis, babcock's rules (formal on weekends, only skirts and dresses for females) are NOTHING compared to covenant. Covenant is worse than primary school. I mean in primary school we openly conversed with the male species!! Plus u could be expelled for engaging in one of their 'bad' conducts OUTSIDE school. Weekdays I meant to say. Discipline is key to orderliness and it produces better fruits than the so-called "freedom"
The whole concept of Christianity and what is supposed to make Christianity a way of life and not like other religions is that there is supposed to be a covenant of choice. True Christians are supposed to make a decision of their own volition to stay pure and not be bound by rules! The kids at covenant should be allowed make the choice to stand for purity by themselves, not by order! Jesus never forced anyone, He allowed everyone make a choice for where they stand, including Jesus. I do not subscribe to experimenting in the way it was described above, however. Overprotected children/teens are always worse off than their normal peers. They should be allowed to see what real life is, instead of caging them. Funny enough, most nightclubs in Lagos are always full of Covenant and Babcock girls, so what exactly are the Uni's achieving? Do they at least have a counsellor in school that the kids can talk to or is she/he bound by school regulations to report impure thoughts? Undergraduates are potential world leaders not puppets.In a university u need to experience what life really entails especially interacting with others both male and female because we are in a nation of language and ethnic diversity.Academic is only about 1% of what we learn in university.As far as am concern what they are learning in those religious universities is hypocracy of the highest order and how to be a dummy.Righteousness can never be forced on people.An undergraduate is mature enough to know good from bad.If u cannot handle urself in a university how can u handle a position independently. @anon i couldnt have said it better myself! LOL I feel u tho. Schools like this are quite silly if u ask me because they are obviously not a representation of the real world. Besides, We all know what curiosity did to the cat? The more u keep something from people, the more they become more anxious. Mid life crises will def be a huge problem for alot of d alumni of the school. as 4 convenant tertiary institution.. its a farce.. i can't honestly employ its graduants till im satisfied that there's a masters degree attached.. thats what i do..
Social ineptitude seems to be the order of the day at most private universities,not becaucse the studentas will it so but because an enforced lifestyle is what they live. This only makes them socially misfit n unsteady when exposed to the real world,as they find out they never really had a mind of their own. I guess something must have happened before this decision was made... do you have any clue? @2cute4u wats wrong with sending your child abroad when the schools at home are not up to standard? I'm sorry but this is as old as hell, find something else to blog about. Send your children to Eton or where ever, knocking this school won't solve your problems. Some outstanding people are alumni, you have no right to be a judge and thats to all you other commeneors. FIRST PRIVATE SKOOL IN NAIJA. its a friggin uni, not sec skool! I strongly disagree with this blogger.I feel we are so quick to judge and pull down what we have without checking how the sooo called developed countries handle theirs.I was just surfing the internet and stumbled on this.WE are all aware CONVENANT UNI IS a christian UNIVERSITY so it should be different(UNLIKE many scenarios where people claim they are christians and are deep in sin and lack of discipline) if it wants to live up to its image.Having worked as a professional in 3 continents-I know convenant is on the right track.Lets stop celebrating what is wrong.There are many christian schools in North Carolina where I currently practice as a pharmacistthat operate under the same principles. That's an insult to primary school, It's a baby-sitting school! They should come to OAU and see what is called university. There is nothing wrong with CU, the problem is most people doing wrong always a repeat of it anywhere they go. What u're seeing in most public schools is wrong. More so if the management of CV were loose on their students, these same set of critics will be the ones to say CU is a bad school! No one can ever satisfy humans! Its unfortunate, no one is talking about the good they are doing in that school. I saw their notes on Total Man Concept, etc, something no other Nigerian uni is impacting into their students, real life and life application teaching! There is nothing wrong with CU, the problem is most people doing wrong always want a repeat of it anywhere they go. What u're seeing in most public schools is wrong. More so if the management of CU were loose on their students, these same set of critics will be the ones to say CU is a bad school! No one can ever satisfy humans! Its unfortunate, no one is talking about the good they are doing in that school. I saw their notes on Total Man Concept, etc, something no other Nigerian uni is impacting into their students, real life and life application teaching! How about that!